SPC03013 Stance+ Street Coilovers Audi TT. Audi TT 1.8T, 3.2 V6. Front Max Axle Weight: 1040kg. Rear Max Axle Weight: 900kg. Height adjustable front and rear. Stance+ DL5 Shortened drop links may be required when lowering more than 40mm. Top mounts not included, uses existing top mounts. Bump stops may need to be shortened. Front wheel spacers may be required. IMPORTANT For safety reasons, coilover kits should be fitted by a qualified vehicle mechanic/technician. Coilover collar threads should be copper greased prior to fitting to prevent seizure. 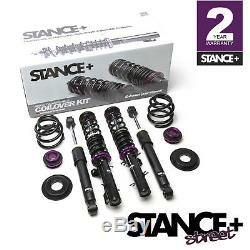 Stance+ Street coilovers are the next generation in high quality, performance height adjustable coilover suspension. The quality, fit and finish is superb! These kits are manufactured with an attention to detail that far exceeds anything we have seen before at these prices! Your car will corner flatter, feel more predictable through fast sweeping bends and with a reduction in body roll the car will change direction quicker and feel far more responsive. The Stance+ Street coilovers have been designed for road use but they can be used for occasional track days. Most applications utilise helper springs, allowing for an increase in drop compared to other brands. Most struts are supplied with built in bump stops and have shorter piston rods to provide a smoother ride when running ultra-low! FUCH oil filled dampers for great ride quality. Short heavy duty hardened chrome piston rods. Powder coated springs and bodies. Helper springs (where necessary) to prevent spring dislocation. Built in bump stops for durability. Anodised dual locking rings (most applications). We sell over 250,000 performance car parts online! Sadly, it is impossible for us to stock all of these parts all of the time and ultimately this would only lead to increased prices. Sometimes a part may have to be manufactured or even imported from another country for you. Where we are informed of a delay we will do our best to keep you updated. We cannot guarantee product availability. Please do not schedule any work on your vehicle until you have received and fully inspected your parts. The item "Stance+ Street Coilovers Kit Audi TT 1.8T 3.2 V6 Coupe Roadster Quattro -06 8N" is in sale since Sunday, March 11, 2018. This item is in the category "Vehicle Parts & Accessories\Car Tuning & Styling\Performance Suspension\Performance Coilovers".